Something Glorious: Things that I love that you should love too. MP3: New Kaiser Cartel "Ready to Go"
Can You Taste the Blood in Your Mouth? Fun with Words ... Really? Remember When Music Was Exciting? Details Names Paul Kahan's Salsa Best in U.S.
A little more than a year ago, buzz started churning about an unknown band from London with a massive, angular guitar sound punctuated by throbbing drums and an underlying danceable beat. It didn't take long for the blogosphere to pick up on what was happening across the pond and before Bloc Party's debut even hit stores, they were already a household name, being featured on the covers of major entertainment and music magazines. Something glorious was truly happening. It wasn't long before that prescient line -- "something glorious is about to happen" -- in "Positive Tension," the third track off Silent Alarm, rang true. When the band toured Stateside following the release of their album, shows across the country sold out in moments, showing the impact the Internet has on emerging artists with a unique sound. 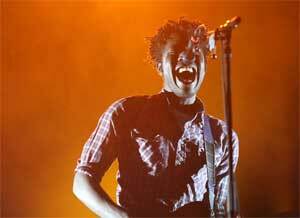 Bloc Party is currently working on their new album, writing a bunch of songs, including "Waiting for the 718," "England" and "Perfect Teens," and working with a new producer, electronic music engineer Jacknife Lee, who has worked with U2, Editors and Pink. This album is hugely inspired by the idea of leisure and lead singer Kele Okereke is attempting to make guitar rock "less skinny and white." SomethingGlorious.com, whose name was inspired by the ever-prophetic line, sat down for an exclusive interview with lead singer Kele Okereke on the band's rickety, ramshackle Winnebago parked just outside Chicago's Intonation Festival in late June. 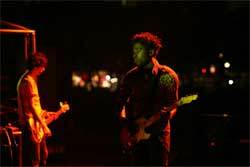 Turns out, the show would be the band's first-ever festival headlining gig, during which Bloc Party played two new songs, including the slow-building dramatic "Uniform" just after a light misty rain started to fall from the sky and cooled the crowd during the climactic "Modern Love." Read the full Q&A below or simply stream it. Thanks to The Cobra Snake for use of his great pictures from Intonation Fest. Check out the video he captured of the band singing "Banquet." SomethingGlorious.com: Will you premiere a lot of new songs tonight? 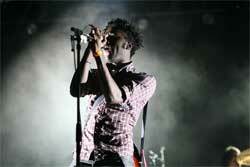 Kele Okereke: We played two yesterday [in Toronto]. It was only a 50-minute set. Since it was an outdoor festival people wanted to hear the hits. It wasn't a headline show. We're going to save it for when we come back in August for about three weeks. We're going on tour with Mew. SG: There was a lot of buzz before Silent Alarm came out. Do you feel a lot of pressure this time around? KO: I think we'd be lying as a band if we didn't feel pressure. We're fans of rock music and we know how it's been in the music press for the last 10-15 years. A band can make a initial impact with a debut record then because of the nature of the industry ... we have to make it as best as we can. SG: Do you feel like that pressure or expectation stifles creativity? KO: The thing is that we've always had pretty high standards as a band. I'm not sure what it is about us, but we're not really comfortable doing anything the easy way. Even if the first album hadn't been a success, we'd still be trying to endeavor and become better musicians and performers. It's something we've been trying to do. Now we're more focused. SG: It's like the outside pressure almost doesn't matter then - you put enough on yourself? KO: It's been like that from the beginning really. I guess, as a band, we have a real ... one of the great things about us, between the four of us, we always strive to not do the thing that comes easiest. We push alternative ways of looking at things. It's the only way you're ever going to get any better. SG: Have you thought about what the album will be called? KO: I have a few ideas but I haven't spoken to the band yet. SG: What makes up the content of the songs? KO: One of the things that was inspiring for me, upon coming back to London after touring last year, I saw a lot of my friends I was at University with who had just graduated. None of my friends had anything positive to say about the transition from being a student to having to do a job. It was just a real sense of "is this it?" a real sense of disappointment. My friends kind of threw themselves into going out and getting fucked up and getting drunk, sleeping around. In my mind, this next album I'm really exploring the nature of leisure and the nature of how to unwind. I'm just really curious about leisure in a modern environment. None of my friends have positive stories about how they're feeling now. SG: Do they get jealous of you - that you've become successful? KO: I'm the only one I know who's doing what I want to do. All of my friends at school were huge music fans and dreamed about making music. When you're that age, you have to see the point of not doing anything else. That's how it was for me. Your friends are your friends and they understand. They wouldn't be true friends if they got jealous. There was one friend who stopped talking to me after we started getting attention. He was in a band too. That's how we knew each other. I thought we were quite close but I guess jealousy is something is a real powerful motivator. SG: The theme is really about leisure and lifestyle and your observations of that - is it also your own ways of leisure? SG: What do you do for leisure? KO: Not very much really. I think that's essentially my problem with it. I don't understand the idea of letting go and behaving in a way that doesn't really excite you. I was lucky that when I was bored, I would grab a guitar and play music. I had no desire to get completely fucked up in a club. I've always had a problem with organized leisure. It's not on my terms. SG: Well you're not getting inside yourself at a club. It's more external energy. Do you prefer to get within yourself? KO: One of the points we kept coming back to is that modern living is really about stealing experience and not really promoting actualization or real engagement with anything, or with anything that constitutes having fun. That reverberates around this new record. SG: Would you call it Modern Living? SG: As far as the sound is it going to be more guitar driven or will Jacknife's electronic background really have an influence? KO: It's funny, Jacknife's influences haven't really figured in so far yet. We haven't really started to mix anything yet. He's been very enthusiastic. He's the best producer we've worked with - oh wait I shouldn't say that [laughs]! SG: He's the best producer you've worked with on this album! KO: Yeah on this album! SG: What about him and his style attracted you? KO: We met like three producers and we tried them all out. We got on best with him and he made the best sounding record. Everyone says they want to make an interesting album but it's more how they go about doing that. SG: Other than making an album that people perceive to be as good or better than Silent Alarm - what are you all hoping to get out of this personally? KO: For me, if I'm honest, it kind of dogs me a little that we're seen as a rock band. Of course we're in a rock band - we play guitars. That's really so far from what I wanted this band to be perceived as. KO: I just really hope that this album goes some way to making guitar rock music to sounding a little less white and skinny, I guess. The music that I've been inspired by haven't been any guitar bands in the last five to 10 years. Of course I love rock music. SG: What have you been listening to? KO: What I find, being in a creative role, if I don't know much about something ... before I started this band I was closeted in my tastes. But we started going to dance clubs and taking ecstasy. In terms of a traditional rock band background, we discovered there was so much more you can do with music than sounding like the Velvet Underground. There's so much you can try to put into it. That was probably an actual impetus for this band - [guitarist] Russell [Lissack] and I would be out dancing at a club to techno and really being moved by it, in a way that we weren't being moved by whatever guitar groups - like bands like Travis. SG: But that comes across in your sound, I mean you're described as dance rock. But it sounds like you want to take it even further. KO: That's what I think. SG: More like soul, funk, hip-hop? KO: Not in those terms. It always sounds contrived when guitar bands say that. I want to make a guitar record that is as thick and colorful and has as much beauty in a synthetic way, in the same way a Missy Elliott record has samples and tiny bits of sound to write a song. It's like that Amerie song, "1 Thing," it's my favorite song in the last 10 years. It's just a drumbeat and the way the bass works with the guitar line. There's a huge amount of space in the song and when the chorus kicks in it's a euphoric moment. As a guitar band, we're used to filling every bar with sound. I think one of the real aims of this record is to be economic and leave space. And have something that isn't just guitars. SG: Are you going to use synthesizers or samples? SG: You're in a really interesting position where you have a sound that is very unique. It seems like you can take this in another direction and have it be a seamless transition. KO: That's the plan - as long as we can make the best record we can make. I haven't really got any worries. With Silent Alarm, we didn't try very hard. I know that sounds arrogant but we just went in and recorded songs we had been playing for a while and embellished some parts. It was a case of necessity. With this next record, we're all being focused on what we do. I'm confident. SG: You said you were thinking of having guests - have you asked anybody? KO: In some places it would be nice - there are two or three songs we're going to use a string section. In other places, I would like the sound of a girl's voice. KO: There isn't going to be a big guest appearance. We're starting to not be afraid of thinking outside of what we do. I love the sound of girl's voices. I like them more than male voices. We'll have to wait and see what happens. It'll probably just be a friend of mine. Ultimately it's about the song and not some singer in a buddy network. It's about the power of being right really. I'm not going to require Mariah Carey - the singer isn't going to need seven octaves. SG: You know, a coup would be to have Tracey Thorn come out of retirement. KO: That would be nice. Or Kate Bush. SG: Or even Beth Orton. How's life for you otherwise - do you feel like a regular guy? KO: Pretty regular [laughs] yeah. SG: Do you take advantage of the fame or success? KO: Yeah, whenever I watch films now, I don't queue - I go straight to the front. I don't have to queue anymore for things. No, I mean we've sold a few records, but we're not famous like Pete Doherty is famous. When I go back to London, all the emo kids recognize me, which is funny because we have a big emo following. I guess that's because indie music has become so weak-willed that kids ... I don't know, there's exciting guitar music but nothing with any real sense of aggression. I guess that's why the emo kids like us - we're darker and heavier than like Franz Ferdinand. SG: What are your guilty pleasures? KO: I don't like throwing clothes away. We just moved house and the room I'm in now is smaller than the one before. I have all these clothes in bags that I haven't unpacked. I'm too scared to throw away really. I also have this thing for buying shoes I'll never really wear. I have about 20 pairs of Converse shoes and I only wear two. SG: Is Converse your favorite? KO: They used to be but then I got this problem with the instep of my foot so I have to sparing about when I wear them. And I've got quite a serious sweet tooth that I thought I would grow out of as an adult but I haven't really. What else? ah! kele speaks! it's nice that he does this for the people that actually care and WANT to know what he has to say without any hidden commercial agendas and therefore without fear of being purposefully misconstrued! he and the rest of the Party should do this more often. I'm actually surprised they've taken exstacy. They really don't seem like a band who would do that, but there you go. Unless I missed a joke? I absolutely love this interview. It was very insightful. I'm anxious to hear the new album with all the fixings. Very nice transcription, I would love to hear ya. love u guys work.. keep it up..
Would love to hear you sometime in the States. Good luck to you! Great article…but who knows what the future may hold. I liked the answer given by Kele Okereke for the question asked by SG - Do you feel like that pressure or expectation stifles creativity? He says that they always kept their standards high. They would always try to learn new things and perform better by improving themselves as musicians and performers. This is infact each one of us should thrive in our own lives. No matter how much we succeed we should alwasy try to achieve new success and stay focused on what we want to achieve. Set our goals right and thrive for it. Thanks for such a wonderful interview with Kele Okereke. Thanks everyone for all your comments about the interview with Kele. I love that I posted this four years ago and people still get a lot out of it! Copyright © 2006 Something Glorious. All rights reserved.